How is the nature of being a teenager distinct from being a child or an adult? To what extent should we protect the innocent from the evil in the world? How can alienation or disillusionment serve as a temporary protective armor? What do our thought or behavior patterns reveal about who we are? To what extent, if at all, is Holden Caulfield suffering from depression? How can a single traumatic episode affect a person's development? In the bumpy and often uneven process towards a more mature perspective of the world, what is gained and what is lost? Click here to find an on-line version of the novel. Click here for an audio book replete with illustrations no less. In table groups, walk around the room for one-minute discussions of each of the seven characters: Holden, DB, Mr. Spencer, Ackley, Stradlater, Jane Gallagher, and Allie. Read Chapters 7-10, pages 52-85. ​Read Chapters 11-14, pages 85-117. Read Chapters 15-17, pages 117-149. ​Read Chapters 18-21, pages 149-183. 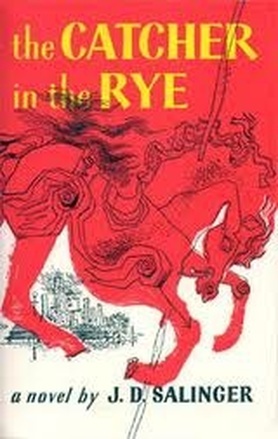 Click here for The Catcher in the Rye Second Half Discussion Questions. ​Read Chapters 22-24, pages 183-213.